Over time, medical staffs have become overwhelmed with the business of healthcare and have fallen asleep on a very critical issue: Medical Staff Bylaws. Physicians who think all bylaws are the same, that they are essentially meaningless and that medical staff members are powerless are simply wrong. ● Medical staff privileges in Florida also ensure access to hospital resources and staff. Any provision that restricts a medical staff member’s access to hospital resources of any kind should be rejected. ● Physicians are legally required to ensure quality in the hospital. As such, provisions in the bylaws that would allow a hospital governing board to undermine the clinical decisions of the medical staff (e.g. with regard to privileges, corrective action, recredentialing and even department/service closure) deserves a second look and push back to ensure that the business decisions of the hospital are not implemented without regard to their impact on quality in the hospital. ● Bylaws may not be unilaterally created by the hospital or the medical staff. They must be the result of collaboration. As such, statements in the bylaws that allow the hospital board to reject bylaws or to change them deserve serious attention and resistance. The board should not be able to undermine matters within the medical staff’s purview unless the medical staff has breached the bylaws or applicable law. Moreover, provisions that state that the bylaws of the medical staff are subject to the board bylaws are inappropriate when the provision can serve as a way for the board to simply change the medical staff bylaws by changing their own corporate bylaws. ● Any reduction in the extent of privileges or the loss of privileges legally entitles the doctor to a fair hearing, and that fair hearing must contain certain elements required by state and federal law. That pertains to physicians on staff in a department or service that has been closed. There is no requirement in Florida or federal law that a physician on staff of a heretofore open department or service should lose their privileges or access to hospital staff or resources without a fair hearing. ● There is no requirement in applicable law for a medical staff member who sues the hospital in connection with credentialing, recredentialing or peer review pay the legal fees of the hospital. 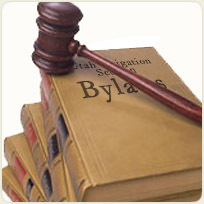 Some bylaws impose that liability on someone who may have substantial grounds for bringing a legal challenge. For many physicians, the nature of their practices require close and cooperative working relationships with hospitals. For most, this means some give and take, but they work. For a few, it means all out war, which is exactly what one doctor found in Naples back in 2006. Lucky for him, he knew his legal rights well enough to fight the hospital…and to win. The Naples doctor was a neurologist and a pain management specialist who practiced at the hospital without a contract. An anesthesia group obtained an exclusive contract at the hospital to provide anesthesia and pain management services. When the doctor’s two year grant of privileges were up and he reapplied for the same privileges he had held, the hospital denied him (without a hearing) the right to continue practicing at the hospital. The doctor sued the hospital to allow him to continue practicing at the hospital. He argued, among other things, that the hospital owed him a hearing before his privileges could be taken. Though the trial court agreed and granted him the right to a hearing, the hospital appealed the ruling. On appeal, the court found that in fact the medical staff rules and regulations did not give the doctor the right to a hearing. Fortunately, however, the appellate court decided that a hearing would be meaningless and that the hospital had no legitimate grounds to deny his reapplication for pain management privileges. The case is extremely important for a couple reasons. First, it reaffirms the long-held view in Florida that medical staff bylaws and rules and regulations are a contract between a hospital and a medical staff. Second, it underscores the importance of how those documents are worded. For instance, the doctor did not have a right to a hearing when his reapplication was denied. Unlike many medical staffs, the language simply was not contained in the bylaws, rules and regulations. The case was a wake up call for physicians and hospitals alike. Medical staff privileges are sacred and cannot be impaired in any way unless (1) the medical staff bylaws, rules and regulations are strictly followed, or (2) the doctor has entered into a contract with the hospital that allows the hospital to terminate his or her medical staff privileges on terms other than what is described in the medical staff bylaws, rules and regulations. Both medical staffs and hospitals should carefully review their bylaws, rules and regulations. They have to be very clear about termination provisions when exclusive agreements are entered into. The hospital should represent and warrant that they have the ability to enter into an exclusive agreement. And finally every doctor must remember that, unless he or she has a contract with a hospital that allows it, he or she cannot be forced off a medical staff without a fair hearing. Medical staff bylaws are a primary mechanism for (1) preserving the clinical integrity of what happens in a hospital, and (2) protecting the rights of the professionals charged with such a duty. Take them seriously. Review them carefully and double check each provision of the Joint Commission that any hospital alleges requires any proposed change to the Bylaws. This entry was posted in Group Practice Concerns, Healthcare Law, Jeffrey L. Cohen, Medical Practices, Medical Staff Matters, Physician Issues and tagged department/service closure, loss of medical staff privileges, medical staff bylaws, medical staff bylaws review, peer review appeal, peer review medical staff. Bookmark the permalink.